Last weekend was action packed, especially considering we’re moving house soon! But as packing seems to be under control, it was great to be able to go to both the Mill Road Winter fair on Saturday (which I blogged about last week) and the Audley End miniature railway on Sunday. 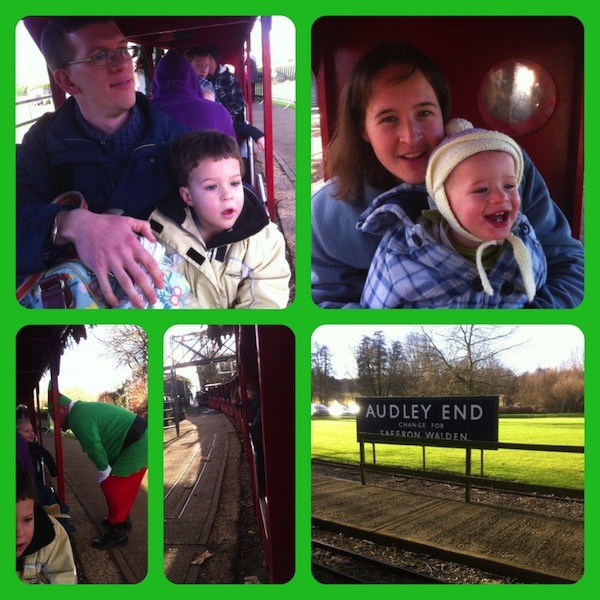 We’ve been meaning to go to Audley End for a couple of years now, since Andrew has been very into trains, but we’ve never quite got around to it, and there’s nothing like leaving a place to remind you to go and do all the stuff you always meant to do! Two of the boys’ Godparents had also offered to treat us to a trip out somewhere for Joel’s birthday present, so we thought this was just the place to meet up with them. 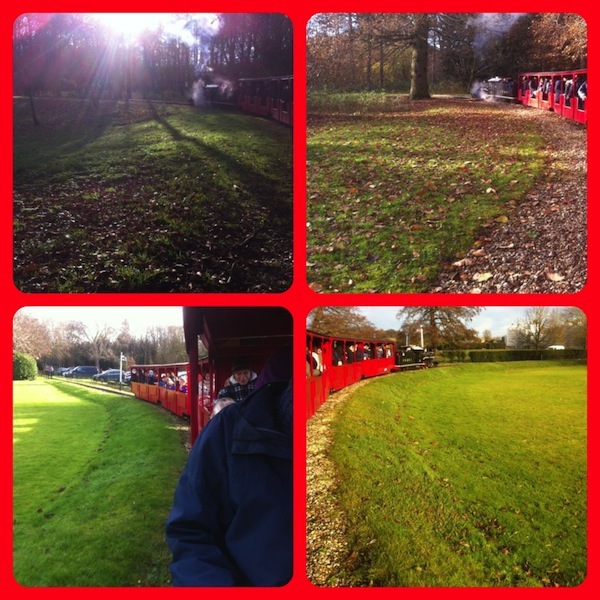 The railway is open for rides in the spring and summer months, plus some special events in the Autumn and Winter at weekends, such as the Christmas specials in December. We knew the trains started at 11am, so we got there pretty much bang on 11am, though had we have known that the car park would be open before that, we probably would have arrived earlier because already there were quite a few families parked, getting out of their cars, and queuing up at the station. We met our friends and joined the queue, after we’d waited at the pedestrian level crossing for a train to go past, which Andrew was most fascinated with! We had to wait about 45 minutes in the queue, but fortunately all three kids were fine during that time, and it was a good chance for us all to catch up. As we got nearer the station, there was an elf walking about talking to the children and being generally friendly. Finally we were near the front of the queue and just made it onto the next train. Each little compartment in the carriages was just right for 2 adults and 2 children, though we don’t get to sit right next to our friends because we were the last on. But once we got going, this didn’t matter anyway because there was so much to see that we were looking out of the train the whole time. Andrew was fascinated, and barely smiled the whole time because he was concentrating so much on taking it all in and pointing out what he could see. I wasn’t sure how much Joel would like sitting still, but he absolutely loved it too, and was happy to sit still and look out, smiling all the time. 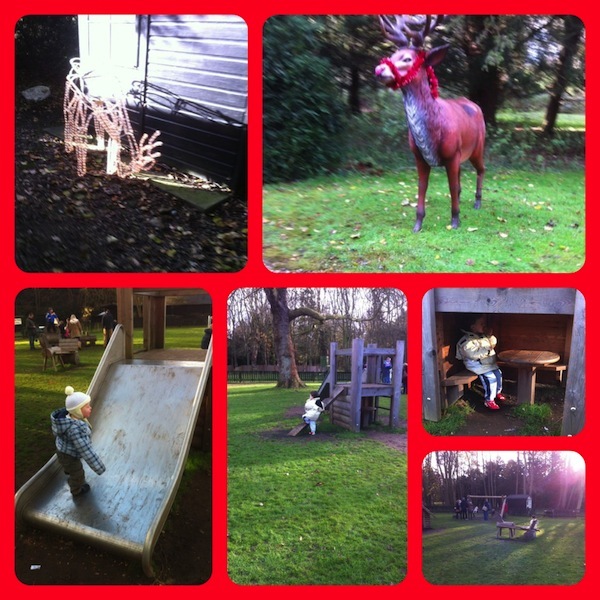 All the way round there were little shelters with (toy) animals in, which were decorated up with tinsel and other Christmas bits. 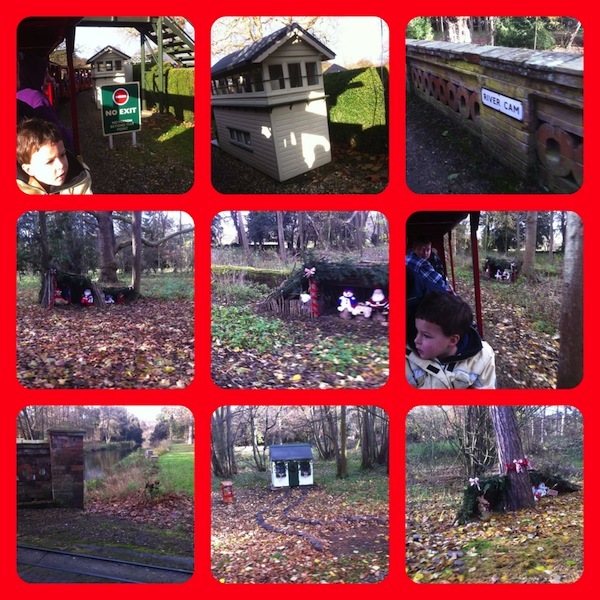 We also saw some little wooden houses and signs naming the places we were riding through. The route is mainly through the woods, and it definitely had a magical Christmas feeling to it with all these things we could see between the trees. There were some tunnels too, which the boys enjoyed, though I wasn’t too keen on as you could really smell the smoke and steam of the train as we chugged through them. Then we started to slow down, though we weren’t near the station. As we came to a halt, to the side of the train was a large hut, again all decorated like the smaller ones we’d seen, but this time Father Christmas came out and greeted us! He walked along the length of the carriages with a couple of elves, talked to us all, and gave the children a present each and a sweet treat to anyone who wanted one. Andrew was keen to unwrap his right away, and was very happy to find a lovely soft toy penguin inside. Joel was interested in his too, and underneath the paper as he ripped it off was a lovely soft toy snow leopard. The boys were happy with their presents, and Father Christmas waved us off on our way back to the station. We even saw his sleigh and some reindeer just past the hut. Eventually we drew back up at the station and got off the train. It was a decent length ride for little people, and I was glad that we’d combined a trip to a railway with seeing Father Christmas, because at only £6.50 per adult and under 2s are free, I thought it was very reasonable compared to some of the local places where you pay £5 each just to go and visit Father Christmas in a grotto. And besides, the boys are too young to really appreciate Father Christmas yet, but combined with a train, it went down very well! We then headed over to the play ground where we attempted to have a bit of lunch, though the kids were more interested in playing on the climbing frames, slide and see saw, especially as there was a train made out of wooden logs – even complete with a bell to ding. Joel’s party trick was to try and climb up the slide, and Andrew ran around like a Duracell bunny before we persuaded him that it was probably a good idea to head home and all have a nap. 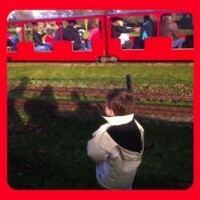 We had a fantastic time at Audley End, and were so glad that we’d managed to go before leaving the area. Linking up with the #CountryKids linky over at Coombe Mill’s blog – why not pop over and see what other families are getting up to outdoors! 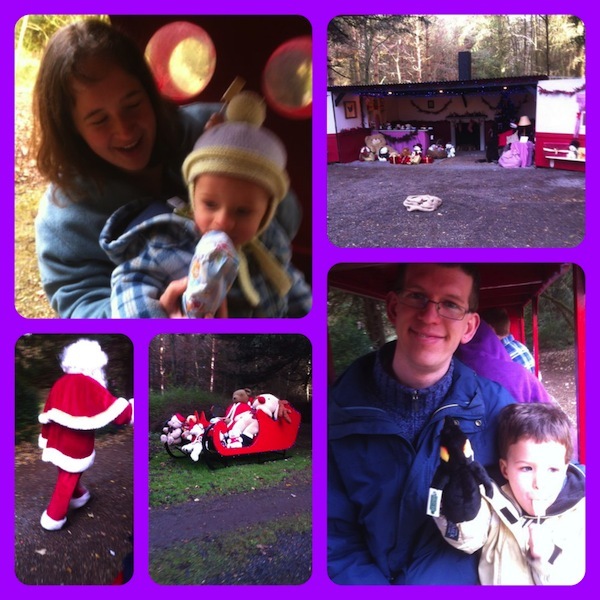 Trains, Santa and a playground – what more could they want for a great day of fun and adventure. What a lovely treat for the boys from your nice friends, and I can see from the photos that children and adults alike enjoyed the day. Thanks for linking up and sharing with Country Kids. Ah yes we never made it to the house, but with the kids now the train was more appealing. Maybe we’ll come back one day and visit the house when they’re older! Next Next post: Slow leopards and sunrise – wot so funee?